Tips, Treats and Musings about the Most Magical Place! 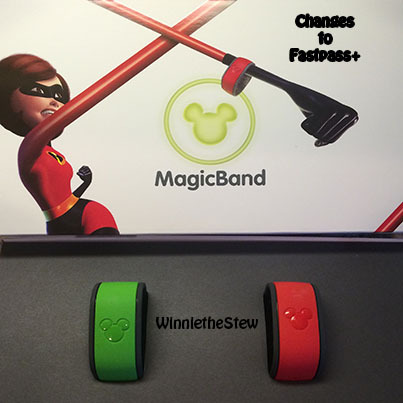 Link FastPasses to your MagicBands. One of the major complaints regarding the new FastPass+ system is that guests are limited to 3 passes per day. In the old system, guests could keep getting passes throughout the day from kiosks as they experienced rides and could even park hop. The Orlando Sentinel has announced that as of today, April 28th, the process will change to allow for more FastPasses. After you use your first 3 FastPasses that you select through the My Disney Experience app, you can go to FastPass+ Kiosks to pick up additional passes. The first three FastPasses must still be used in the same park; however once you have used your 3 passes, you are free to park hop and use FastPass kiosks in other parks. The same rules apply wherein you must wait for the prior FastPass timeframes to expire before acquiring another pass. The system for FastPass+ continues to change as the MagicBand process is monitored and evaluated by the Walt Disney Company. I am sure in the future we will see additional benefits and opportunities for FastPass+ as guests give feedback regarding their experiences. This entry was posted in MagicBands and tagged Disney FastPass, Fastpass+ Changes, FastPass+ Park Hop, FastPass+ Park Hopping, FastPass+ Unlimited, MyDisneyExperience FastPasses. Bookmark the permalink.